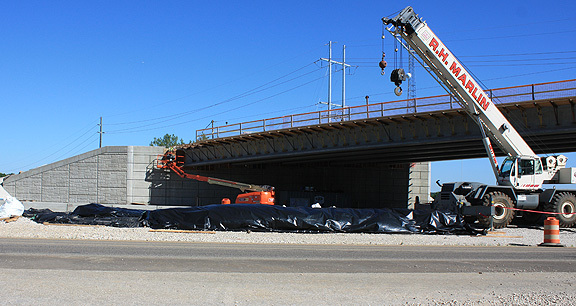 Project obstacles and solutions: As part of the I-69 expansion project, a new bridge was designed to cross the interstate at 17th Street in Bloomington, Indiana. This is one of numerous bridges that Force Construction built as part of the new highway section. Most of the bridge buttresses along the highway used precast panels for retaining walls. However, after soil tests on the western side of the highway determined some instability, it was decided that a poured concrete and steel reinforced structure would be needed. The buttress and wall required 1,000 yards of concrete. The wall was poured 5 feet thick and was 26 feet tall by 170 feet long. Building a structural wall solved the soil stability problem, but it also needed to match the design of the other retaining wall panels for aesthetic appeal. IMI QC/QA suggested using a flowable, self-leveling, self-consolidating concrete (SCC) mix that could be poured into forms that had a decorative pattern that matched the precast panels. The mix was poured into the forms and took minimal vibration to place. The specifications called for strengths of 4,000 psi/550 flexural. IMI supplied 500 yards of SCC for this project. The SCC met strength requirements in three days. The patterns mimicked both rough-hewn limestone and smooth, stacked blocks. The SCC filled the forms and left no gaps or holes in the wall. For more information on SCC concrete, contact the sales representative for the concrete plant nearest your location. Click here.